We are delighted to announce that building work has begun on our highly anticipated and incredibly exciting Spa Project – this purpose-built facility will have everything you will need to relax and unwind in whilst being pampered in luxurious surroundings. The proposed complex (artist impression above) will be built adjacent to and raised above the outdoor pool. The spa will take advantage of the Sea view and each guest area has been designed so that where possible you can gaze out to sea whilst you are relaxing. Facilities will include an indoor hydrotherapy infinity pool, Indoor Steam Room and Sauna. Indoor and outdoor experience showers. Two single and a couples Treatment room, a well stocked Gym, a tranquil post treatment relaxation room and warm reception with a welcoming fire, so even in the cooler months you can indulge in a spa break. Outside on the decking we hope to provide an outdoor hot tub and barrel Sauna with an area of seating for coffees and light refreshments. The decking will sweep round and lead to the outdoor pool, which will also be refurbished and heated so we are able to open the pool between April and October. The spa will use colours and materials to evoke Cornwall and its Tin Mining History. Coppers, Bronzes, Brass, Tins, Silvers and Granite will feature and also colours taken from the local natural environment such as the amazing blues and turquoises which are prominent in the cove when you look out to Sea or the olive greens of the local serpentine in the cliffs. The other underlying and subtle theme will be that of Japanese influences. Japan is an island nation and thus surrounded by sea but also having spiritual retreats in high, rural locations which fits with the Spa’s location. The natural benefits of the lizard serpentine helps to aid meditation and enhances spiritual exploration, it clears the chakras and fills your life with positive energy. The use of Seaweeds and Sea salts within the treatments and products will add a feeling of natural and organic relaxation. The sense of well-being and outdoor living will be brought through from the atmosphere of the spa. 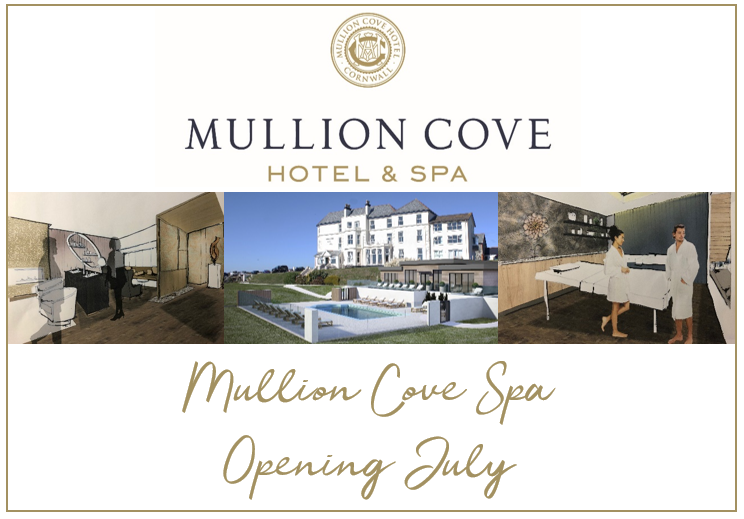 The use of natural sounds, such as recordings of the Mullion sea washing against the pebbles in the harbour, along with the use of foraged seaweed from the lizard and salt products derived from the Lizard peninsula (and full of natural nutrients and minerals from the sea) will offer a unique experience guests will only find at the Mullion Cove Hotel.